Cambridge University Hospitals (CUH) are dedicated to making biomedical research both relevant and accessible to the general public, to patients and their carers. There are a number of ways in which you can get involved. 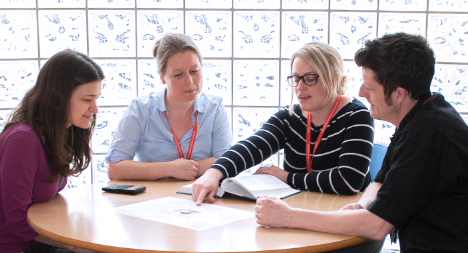 Not all involve taking part in a clinical trial; members of the public can join CUH’s patient & public involvement panel where you are asked to review research protocols and patient information leaflets, or you can take part in other ways. Visit the Research & Development pages on the CUH website to find out more. You can learn about the research we do here at the NIHR Cambridge BRC with our one minute videos with the theme leads. You don’t have to have a health condition to take part in research, we also need healthy volunteers. One of the ways you can take part in research by joining the NIHR BioResource, whether you are a healthy volunteer or have a health condition. Watch the short video below to find out what being part of the NIHR BioResource involves. This is Katie who has taken part in the artificial pancreas study at our NIHR Cambridge Clinical Research Facility. Katie met children’s research nurse Janet Allen, to discuss why children are asked to take part in research studies and the work happening with the artificial pancreas. The NIHR Brain Injury Healthcare Technology Co-operative (HTC) has developed a volunteer register for patients, carers and other interested persons to assist in the development and advance of healthcare technologies. The Cambridge NIHR BioResource: A panel of around 17,000 volunteers, both with and without health conditions, who are willing to be approached to participate in research studies investigating the links between genes, the environment, health and disease. The NIHR Cambridge Clinical Research Facility: A facility for patients and volunteers who are participating in research (both adults and children). It supports experimental medicine and early phase research studies. UK Clinical Trials Gateway: Find out what it means to take part in a clinical trial, sign up for trials, look for trials relevant to you and contact researchers. Cambridge Brain Bank: Established to enable brain tissue to be used after death for research into neurodegenerative disorders such as Dementia (Alzheimer’s, Frontotemportal etc. ), Motor Neurone disease, Huntington’s disease, Multiple Sclerosis, Parkinson’s disease etc.